Here’s a new non-QM product for real estate investors who don’t qualify for typical agency loans — and a great NICHE product to help you stand out. 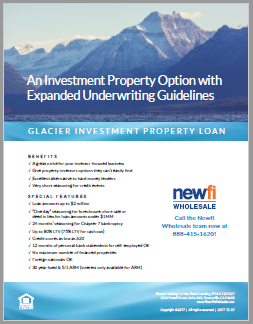 Introducing the Glacier Investment Loan Program! For more information, call the Newfi Wholesale team at 888-415-1620.